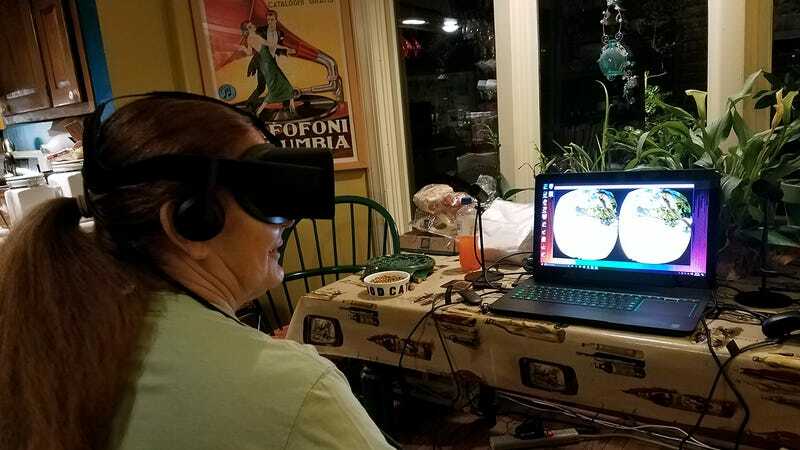 On Christmas evening, after the rest of our extended family had fled to their respective homes, I hooked up my Oculus Rift to the new Razer Blade Pro, pushed aside the plants and cat food bowl on the keeping room table and introduced my 70-year-old mother to virtual reality. It went quite well. To be fair, it’s a pretty big backpack. The idea came to me during my recent review of the latest iteration of Razer’s 17-inch Blade Pro. With the laptop less than an inch thick and powered by the mobile version of Nvidia’s Geforce GTX 1080 graphics card, I figured I could fit it and my Oculus gear into a single backpack. Given a big enough backpack it worked, creating an excellent way to demonstrate VR on the go, rather than have to go through the trouble of trying to clean my office and make my children put on pants. The initial plan was to get to Christmas dinner early and set up the equipment, allowing everyone present a turn at the controls, but the more I thought about it, I realized there was only one person I really wanted to share this stuff with. I’m the small one in the photo. My mom is the one who isn’t my grandmother. The colors are the 1970s. My mother and I have been close since the beginning. The first nine months or so of our relationship we were inseparable, and we stayed that way for the better part of 18 years before I struck out into the world to make my fortune. We’ve shared a great many things over the years, but outside of a whirlwind romance between her and the Myst series, we’ve never really connected on a gaming level. Video games were always a thing she bought me, something that kept me from doing my chores, going to bed at a decent hour or finding a nice woman to settle down and make grandbabies with. It’s a part of me I’ve always wanted to share with her. Over the past few years my mom’s gone through a barrage of health issues, physical and mental, that grew so severe I was afraid I was going to lose her. Thankfully, following an extended hospital stay in late October, her health has taken a turn for the better, and she’s sharper than she has been in ages. And so I sat her down in her keeping room after an exhausting day of relatives and let her fly. This is the first time I’ve ever seen my mother hold a gamepad. I did have to move her fingers a little. You’ve probably seen the hilarious videos of older folks trying virtual reality for the first time. They shout and laugh and get disoriented, accidentally knocking over things or hitting relatives. Not my mom. My mom is chill. Oddly enough, she took to the Touch controllers better than the Xbox One gamepad. I tried to get her drawing in Story Studio’s Quill, but we needed a little more space than what we had available and more time for her to figure out the controls (she really wants to get back to that one). Finally, we moved on to a game that I was sure would blow her mind completely, Ubisoft’s Eagle Flight. Controlling a flying creature by tilting one’s head is a huge leap from clicking about a pre-rendered paradise. Surely it would present a challenge. Nope. It’s as if the woman had already been an eagle at some point and was just verifying everything here was in order. She was slightly nervous about getting too close to buildings, but soon she was swooping under bridges as though she were wearing a “Born to Swoop” trucker hat. That’s not to say she wasn’t excited. Her first question when I called to follow up on her virtual reality experience earlier today was, “When can we do it again?” followed quickly by, “Can it take me underwater?” So now I’m downloading a bunch of games for round two. I just realized most of the pictures of my mom in this article are from a horrible angle. Here she has a face, and one of my children. My mom and I never really got a chance to go many places together when I was a kid. Now that I’ve got virtual reality hardware and assurances that she can handle eagle swooping without losing Christmas dinner, we’re going to go everywhere.